for Valentine’s Day and came up with a couple different ideas! 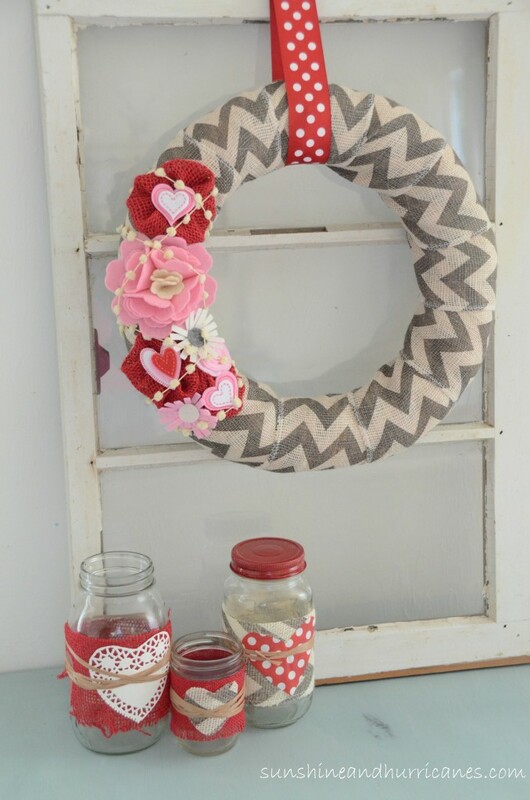 Remember the super easy & quick 15 Minute Valentine’s Wreath? 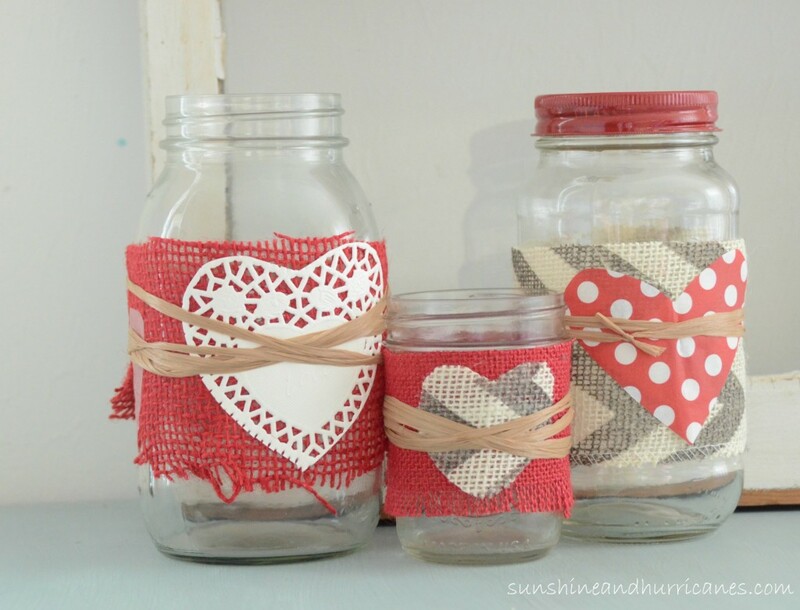 I had leftover chevron burlap and other scraps so I tied and taped the extras on a few jars. Voila, the perfect complement to the wreath and all in 10 minutes! 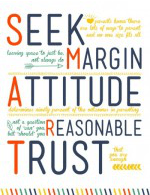 How easy is that? , and whatever else I could find around the house, attached them to fishing line and taped inside the lid. I stuck a cupcake liner over the inner piece of the lid and then the ring piece over that, just to make the top festive, too! The last step was adding trims and ribbons from my stash to give some texture extra pop to the jars. I just love grouping things together and creating cute little vignettes out of things you have on hand! 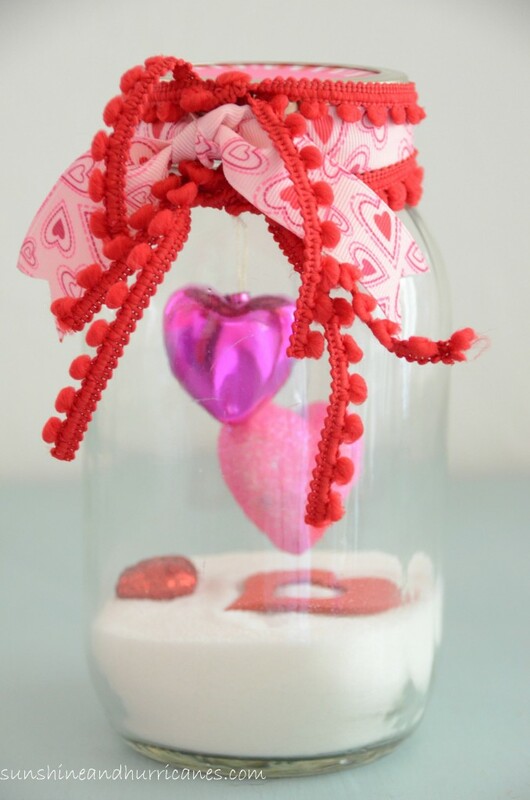 After Valentine’s Day, you can empty the jars, tuck the embellishments away and recreate some fun next year! It took me less than 15 minute to make all of these. I think it’d be adorable to make a bunch for co-workers, friends, and neighbors or even invite some girlfriends over and let everyone go crazy creative with a few jars! Oh my goodness, I am in love with that chevron burlap! these are such darling decorations! These are so SWEET!! Love them! These are a perfect decoration and I love that you used your leftovers.. and sugar! Fun! I love the burlap ones! So vintage chic! I love mason jars too. Great use of leftover pieces from your previous project. 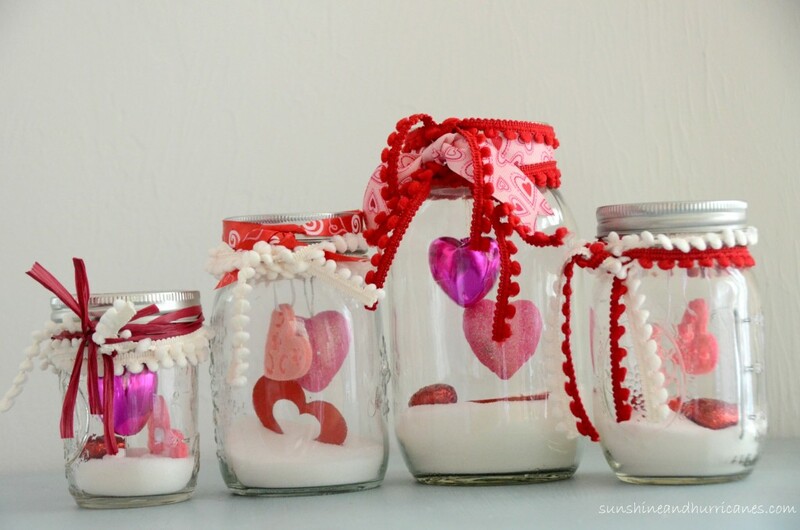 These would be great for teachers’ gifts for Valentine’s day. These are really cute! I love the pink and red colors…they just say LOVE!